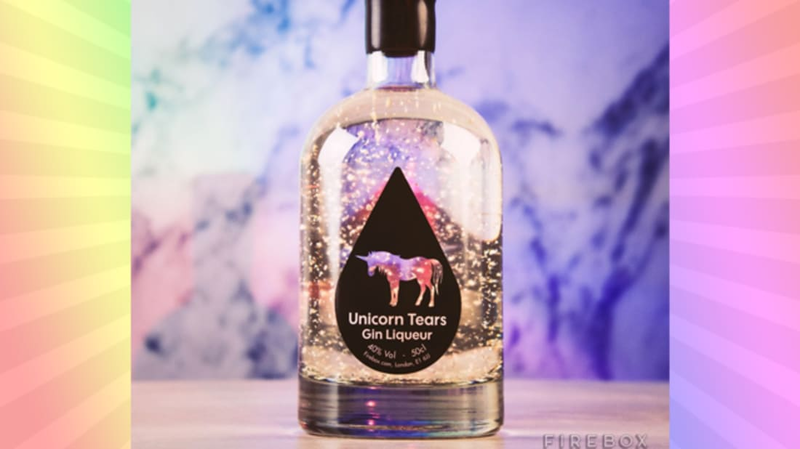 Novelty gift store Firebox is selling a type of booze called "Unicorn Tears." The shimmery drink has little bits of edible silver in it, making each bottle look like a glittery snow globe. At 80 proof, its effects are hardly imaginative. Bringing you this enchantingly scrumptious Gin Liqueur has been no easy feat. We’ve lost mammoth minutes of beauty sleep over the past few months—because we’ve been up all night slaying unicorns for your drinking pleasure—believe us when we tell you those frisky little buggers aren’t easy to snag. A harrowing quest, some courageous Fireboxers were lost along the way, but it was all well worth it because blimey is this stuff fantastic. Yikes. So what does the massacre of sparkly, magical beings taste like? Orange, with hints of juniper and maple syrup. The sugary booze will probably be easier to swallow than the hard truth that the drink came from the tears of a murdered magical pony. If the slaughter of these majestic beasts doesn't faze you, they offer some cocktail recipes for your next shindig with Voldemort, including a Tears Collins or Unicorn Fizz.